During 2012 China auto show in Beijing the new Porsche Cayenne GTS 2013 made its appearance, boasting a new more powerful engine, a stronger chassis, a lower ride height and a lot of sporty equipment. 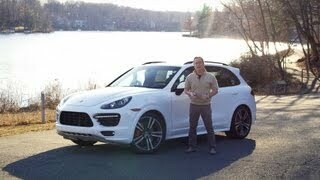 Basically, the Porsche Cayenne GTS 2013 is meant to fill the gap between the Cayenne Turbo and the Cayenne S, while developing its own identity at the same time. One of Cayenne's main characteristics is being a SUV while delivering the sporty feeling you'd normally get from a regular sports car. 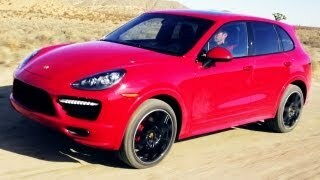 The Cayenne GTS 2013 remains true to this idea and packs an upgraded version of the engine found in the Cayenne S. The 4.8 liter V8 unit found in the Cayenne GTS 2013 develops 420 horsepower and is able to go from 0 to 60 mph in 5.7 seconds and from 0 to 100 mph in 13.3 seconds. The top speed is 162 mph and as far as fuel economy the GTS 2013 features start/stop for better fuel economy and lower CO2 emissions. The result is 22 miles to the gallon. The manual gearbox has been dropped and the 4.8 liter V8 engine is now mated with a tuned-up eight-speed Tiptronic S gearbox, but the sporty updates aren't stopping here. ThePorsche Cayenne GTS 2013 has been fitted with Porsche Active Suspension Management whilst the ride height has been lowered by 24 millimeters for improved handling. 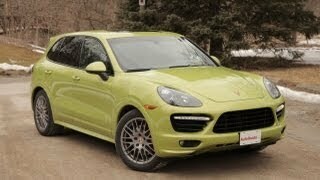 In addition the Porsche Cayenne GTS 2013 will offer a Sport Chrono package as an optional extra. The Sport Chrono package consists in a few sporty touches on the dashboard such as a dash-mounted stopwatch, and will also come with launch control as well as a "Sport Plus" button which will tamper with the Porsche Active Suspension Management once is pushed, delivering a stiffer suspension and more responsive steering. The exterior of the Porsche Cayenne GTS 2013 suffered minimal changes, both the hood and the front fascia are similar to those found on the Cayenne Turbo, but the GTS 2013comes with a sport exhaust system featuring four black tailpipes and slightly modified wheel arches and side skirts. Furthermore, the GTS 2013 comes with a set of 20 inch RS Spyder wheels. As far as the interior of the Porsche Cayenne GTS 2013 goes there's not much to say because little is known at this point. The only information given by Porsche in this matter is that the GTS 2013 will pack Alcantra-upholstered eight-way power adjustable front seats. 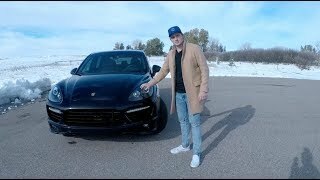 As for availability and pricing, expect the Porsche Cayenne GTS 2013 to hit the market in August at the base price of $82,050, roughly $24,000 cheaper than the 2012 Porsche Cayenne Turbo, almost $4,000 cheaper than a 2012 BMW X5, but $28,000 more expensive than a 2012 Jeep Grand Cherokee SRT8.